These test probes are designed to be used for cycle testing of switches, buttons, keypads, keyboards, and membrane switches. Life cycle testing and even cosmetic wear testing can be achieved. These finger test probes can be used with our Pneumatic Finger Testers and Motion Pro Testers. They can also be used for your own custom designed tester, other life cycle and fatigue testers, or switch and bounce testers. Any time a simulated finger press is required, our standard finger test probes should be considered. These probes conform to ASTM 1578 and ASTM 1597 Fig. 1 or Fig. 2. 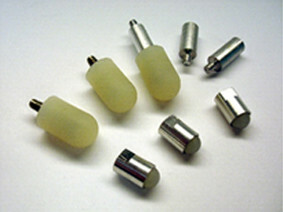 The test probes are available in a variety of mounting thread options. The hardness and dimensional aspects of the test probes are maintained and tested to match these standard button and switch testing specifications.